What’s in store (pun intended) for 2019? The Local Search Association kicks off each year with a compilation of its members’ predictions. This is our third consecutive year submitting predictions. While our 2017 prediction proved way too optimistic, our 2018 prediction, and the two we submitted this year, resonate well among those of our peers. Might brick-and-mortar benefit by borrowing now familiar concepts from their online counterparts? In fact, Marc Poirier of Acquisio, a business local to us in the Montréal area, specifies exactly how Google breaks down [the] barrier to entry for local advertisers (p. 34) to make our previous prediction a reality. 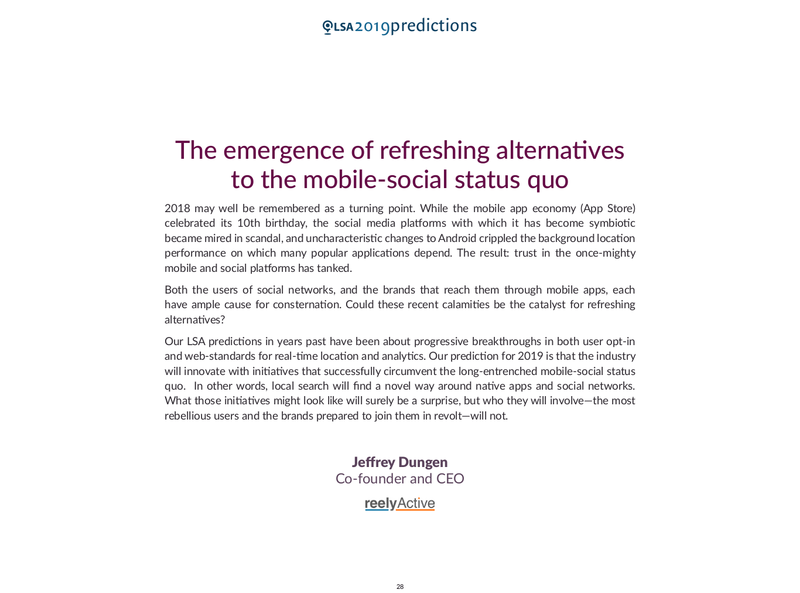 One of our two predictions this year was The emergence of refreshing alternatives to the mobile-social status quo, the paradigm which has largely characterised the current decade. Perhaps the best indication that change is afoot is the dearth of predictions about social networks! The Social & Reviews section is a mere four pages long, with one prediction being our own, and another, by Surefire Local‘s Shashi Bellamkonda, being that Google will finally get social right (p. 26). Indeed if there’s one prediction that has us excited it is the growth of No click search results predicted by Infront Webworks‘ Michael Hodgson (p. 15). Thanks to the aforementioned structured data in the form of Schema.org, anyone — not just Google — can present information in a novel way to users through the web browser. In fact, one of our current top initiatives at reelyActive is in-page search of physical objects within physical spaces, leveraging these same standards. 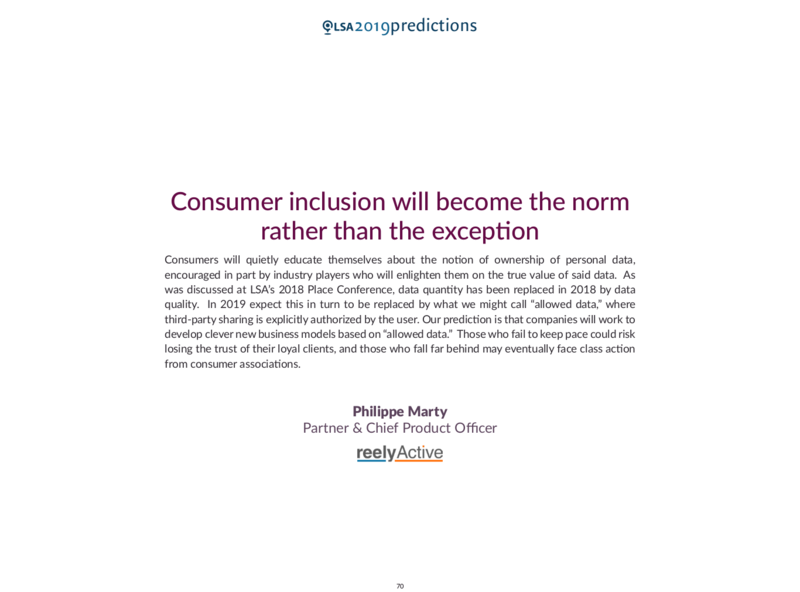 The other of our two predictions is that Consumer inclusion will become the norm rather than the exception. As many experts cite in their predictions, the subject of ownership of personal data has come to the forefront, as was clearly the case at the LSA’s Place Conference a few months previous. Jeff White of Gravy Analytics predicts that The data privacy storm is coming (p. 66) while Skyhook‘s Kipp Jones suggests that “the rumors of the death of privacy have been greatly exaggerated” (p. 54). While there’s consensus among the experts that change is coming, the nature and impact of that change is, however, very much up for debate. Own your website. Own your accounts. Own your data. This mantra is as befitting to the individual user as to the brands and businesses with which they interact. We’d therefore be pleased to see the conversations about data ownership around the board room table translate into more meaningful conversations around the kitchen table. While 2019 is sure to bring improvements in the way that machines understand the real world, success in the local space will continue to be built on remarkable service, reputation, and relationships. 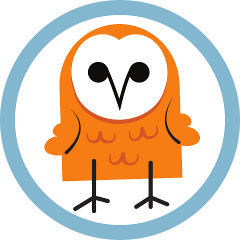 Here’s to a successful 2019 for local search, to a broadly-accessible standards-based web, and to serious industry and individual introspection about privacy!